The word "shroud" originated in fourteenth century England to describe the clothing used to dress or wrap a corpse prior to burial, derived from older words scrud meaning garment and screade-a piece or strip of fabric. It has since become widely used to refer to garments or coverings specifically made to dress the dead body prior to its final disposal, whether by burial or cremation. Its form generally ranges from a length of cloth to basic loose-fitting purpose-made garments. 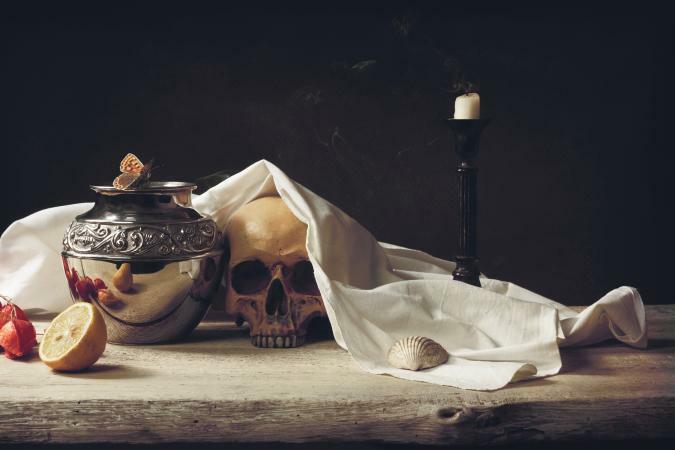 Although the word shroud can be traced back to a specific place in history, it should not be regarded as the point when burial clothing for the corpse first became used. Contemporary descriptions, archaeological accounts, and artistic depictions occasionally provide evidence of shrouds from earlier periods of history and other cultures, although examples of actual garments rarely survive intact, usually decaying along with the body they were used to dress. An early reference to shrouding can be found in biblical accounts-the New Testament describes Jesus' body wrapped in a linen sheet for burial. The early shroud fulfilled the function of containing the decaying corpse, while modestly covering the body. During the eleventh century, ordinary people would have clothed their dead in a loose shirt before wrapping them in a sheet, often colored rather than white, and sometimes swaddled or wound tightly with extra bands of cloth. The sixteenth-century shroud, also referred to as a winding sheet, was usually a length of linen, which was wound around the body and secured by knotting the fabric at the head and feet. Containment and ease of transporting the shrouded body was important as most people were buried without a coffin at this time. Cunnington and Lucas (1972) and Litten (1991) both provide detailed descriptions of variations of English shrouds before the twentieth century, including alternative grave clothes used for the aristocracy and royalty. Shrouds increasingly became indicators of social status, reflected in changing designs. A Parliamentary Act was passed in 1678 to enforce burial in woolen shrouds, to promote the ailing English wool trade. A legal document had to be signed at each burial certifying that the corpse had been buried only in wool. The wealthy disregarded this, preferring to pay a fine rather than bury their dead in wool, choosing instead more expensive fabrics and trimmings made from linen, silk, lace, gold, and silver which seemed more appropriate to their social status. Early shrouds were made specifically for each corpse, often by a family member. The growth of the new under-taking profession from the early eighteenth century onward, coupled with changes in textile and garment manufacture, led to an expanding range of ready-to-wear shrouds in a variety of styles, fabrics, and prices. A typical woolen shroud set at this time might have consisted of a long flannel shirt with a front opening edged in woolen lace or black thread, long sleeves with gathered wrists, a pair of gloves, a cravat, a cap or headdress, and a small square piece of cloth to cover the face. Victorian shrouds resembled long one-piece nightgowns, white with back opening and long sleeves. The range of fabrics had expanded to include calico, cashmere, linen, muslin, poplin, satin, and silk, trimmed with ruffles, lace, or pin-tucks depending on personal choice and the gender of the corpse. Designs available increased throughout the twentieth century, also becoming more gender-specific. Within the Western funeral industry, particularly in the United Kingdom and the United States, male shrouds became described as robes, resembling dressing gowns in darker shades of paisley, satin, or suiting. Some give the appearance of a formal suit but are constructed as a one-piece garment. Ladies shrouds have become gowns, frequently styled like nightgowns in pastel shades of satin, taffeta, or printed cotton and trimmed with lace or ruffles. All are full-length, long-sleeved, and open-backed to assist the funeral director in dressing the corpse. Religious belief frequently provides traditional guidelines for clothing the dead, using specific garments with their own significance. Shrouding the body (kafan) plays a central part in Islamic burial ritual, using plain white lengths of cotton for everyone, regardless of social status or wealth, although variations may occur. After washing the body, it is systematically wrapped in several unstitched pieces of cloth, three for men and five for women. One piece has a hole cut out for the head, resembling a long basic shirt, which covers the whole body. Shrouds form a similarly crucial part in Jewish burial ritual. Simple white burial garments (tachrichim) are used to clothe the body regardless of gender, avoiding ostentation and emphasizing equality after death. Garments include a head covering, shirt, pants, belt, and finally a linen sheet. Fabrics generally used for the garments are white linen, cotton, or muslin and traditionally hand-sewn, although machine-made sets are now available. Contemporary Western society exhibits a diversity of styles in clothing for the corpse, dependent on age, gender, religious beliefs, and broader cultural background. Anecdotal evidence from within the funeral industry suggests that the use of everyday clothes is increasingly replacing shrouds, especially in the absence of cultural traditions specifying particular garments. The choice of a final outfit for the deceased becomes a meaningful act for the bereaved family or friends and presents an appropriate last memory, particularly if viewing the body. To be dressed in their own clothes signifies a heightened sense of the individual before death, illustrating aspects of personal taste and character and forming an increasingly important part of personalized funeral ceremonies from the late twentieth century onward. A growing awareness of the environmental impact of contemporary Western burial and cremation practice is also producing alternative shrouds to those manufactured by the mainstream funeral industry. Simple biodegradable shrouds can be found within the green burial movement made from lengths of silk, wool, unbleached cotton, or linen, large enough to envelop the body. Despite variations in shrouds both historically and cross-culturally, clothing the corpse remains a significant part of the final rite of passage in all human societies for whom clothing is important during life. See also Ceremonial and Festival Costumes; Mourning Dress. Cunnington, Phillis, and Catherine Lucas. Costume for Births, Marriages and Deaths. London: Adam and Charles Black, 1972. Litten, Julian. The English Way of Death. London: Robert Hale, 1991.